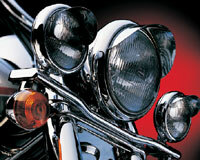 The story of Cobra motorcycle accessories started 25 years ago. When Ken Boyko the founder of Cobra first began the company it made its name in the ATV market, selling upgrades and aftermarket exhausts for the all-terrain vehicles available at the time. 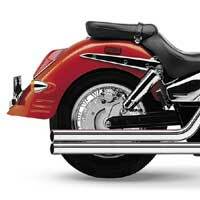 The first products manufactured by Cobra were exhaust systems, and soon they branched out into the motorcycle market. In the late 1980s, Cobra decided to to build some custom bikes to show off their aftermarket products aimed at the Japanese cruisers. Several bikes were built to show off the Cobra exhaust systems, but to when the dealer's saw the bikes, they were more than impressed with the other extras that were included on the custom bikes. Cobra quickly branched out into other aftermarket products for the metric cruiser market. A range of bolt on add-ons became available, which included sissy bars, running boards, foot pegs and a host of other products. Today, the Cobra products are extremely well-known and parts are available for virtually any metric cruiser on the market. The company manufactures a huge number of exhaust designs alone! From the beginning, the aim of Cobra has been to manufacture bolts on products that bring customization into the reach of the ordinary motorcyclist. Not everyone wants to take a grinder to their metric cruiser, but Cobra has brought the customized feel to the people who spend an awful lot of their cash in on their pride and joy . Since 1987, Cobra have used the idea of building show bikes as a way of demonstrating the application of Cobra motorcycle accessories on stock metric cruisers. Almost from the beginning, Ken Boyko has worked closely with Danny Berg to showcase the range of Cobra motorcycle accessories on some fantastic show bikes. Over the years Danny Berg has collaborated with Cobra motorcycle accessories to createÃ‚Â over 20 fantastic show bikes, from low-slung Road Stars to Honda choppers. As the years have passed each bike has moved more and more away from the stock bike to the true custom, but even so, all the bikes have two things in common; they all have cobra motorcycle accessoriesÃ‚Â hanging off them at every turn, and they all look fantastic! So, you have your metric cruiser sitting in the garage, and you want to customize it! But where do you start? Well, most people start with Cobra's lead products, the exhaust systems. The possibilities are endless, with a complete range of slip and full exhaust systems. A Cobra exhaust setup can transform your cruiser in a matter of hours. Another favorite with customizers is the Cobra sissy bar range.You can get the sissy bar to fit your bike very easily, and it's one of the simpler jobs you can take on that will transform your cruiser. 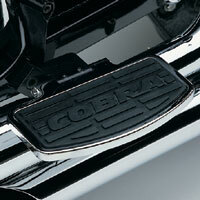 Cobra running boards are another favorite with customizing bikers, and it's another job that almost anyone can take on. 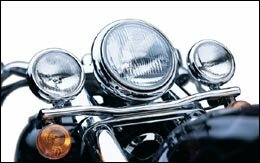 Another bolt on accessory that you can easily add to your bike is a new set of light bars. 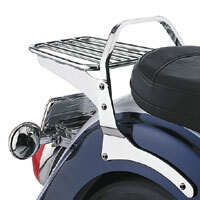 Cobra make the bars to fit virtually any cruiser on the market today. And boy, do those bars really make a difference! I havent mentioned the billet license plate holder, the freeway bars, the tachometers, the drive chain covers. It just goes on and on and on! In my mind, the only drawback with Cobra motorcycle accessories is that they are relatively common. You can still get a decent customized effect however, it just takes a little bit of imagination and planning to ensure your bike will really stand out from the crowd. On the plus side, you know when choosing Cobra motorcycle accessories that they will always be available. There are a number of online suppliers, which stock the full range of accessories from cobra, so there and have any problems obtaining the parts you need for your bike . As Danny Berg, master custom bike builder and Cobra motorcycle accessories guru says, "Its not rocket science"